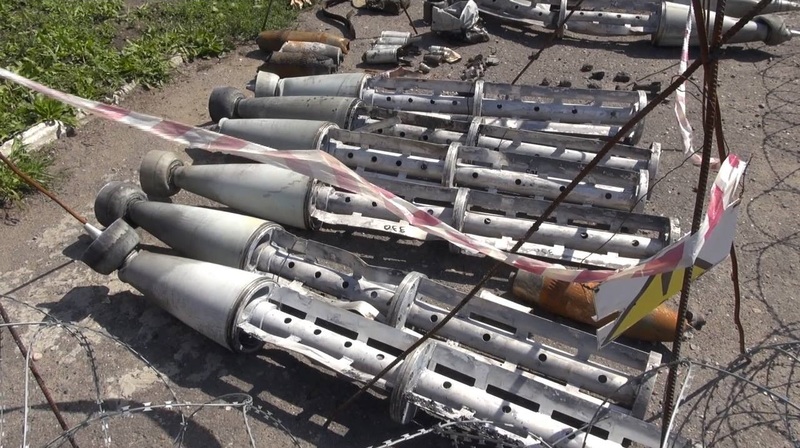 Armament Research Services (ARES) was provided earlier today with images showing the remnants of several artillery rockets in Slavyansk, Ukraine. These images show the nose cones and cargo sections belonging to 220 mm 9M27K series cluster munitions. Remains of 9M27K type rockets have previously been photographed in Syria, as identified by ARES here. The 9M27K series of rockets are fired from the 9K57 Uragan (Ураган; ‘hurricane’) multiple-launch rocket system (MLRS). Unlike the 300 mm 9M55K cargo rockets documented in Ukraine last week, the submunitions from these rockets have not yet been definitively identified from markings. Both the Ukrainian and Russian armed forces possess the 9K57 system, and neither Ukraine nor Russia are party to the 2008 Convention on Cluster Munitions. 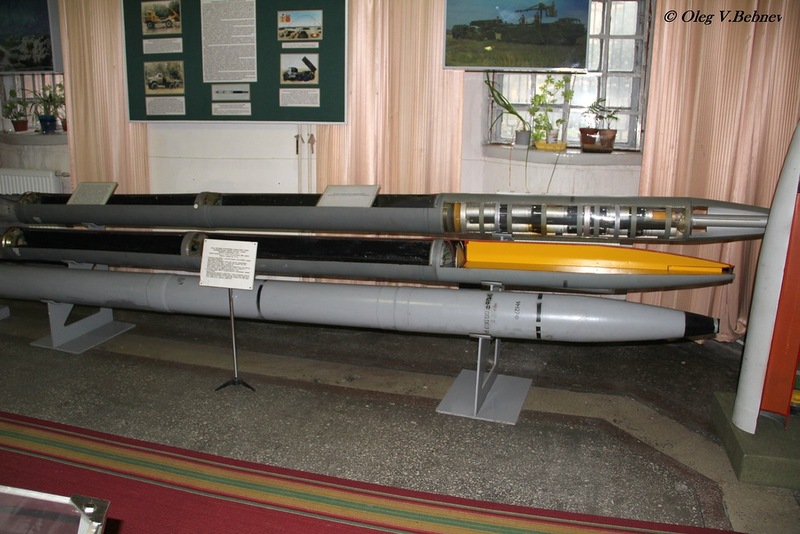 The photo below, taken in the Military History Museum of Artillery, Engineers and Signal Corps in Saint Petersburg, shows mock-ups of the 9M27K and 9M27F (HE-Fragmentation) rockets on display. The second photo, taken at the 2006 International Defence Exhibition of Land Forces in Moscow, displays a mockup of the 9M27K warhead. The components seen in Ukraine, part of the warheads’ cargo sections, indicate that 9M27K and/or 9M27K1 rockets were employed. 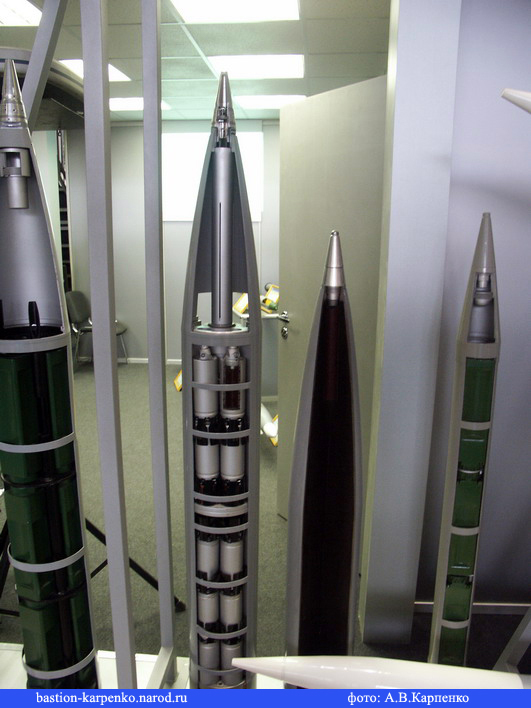 The 9M27K and 9M27K1 cargo rockets carry similar 9N210 and 9N235 submunitions, respectively. 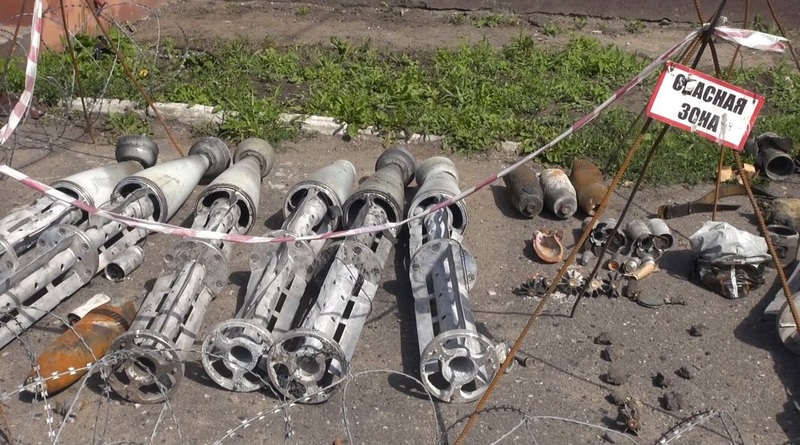 Whilst it is not certain who employed these munitions, it is most likely that they were fired by Ukrainian government forces targeting pro-Russian separatists. The technical characteristics of the 9M27K are given below. Anyone with further images or video of submunitions associated with these munitions is invited to contact us. The 9M27K cargo rocket with 9N210 fragmentation submunitions is designed to engage concentrations of infantry and light vehicles in open terrain or light cover. Special thanks to Balint Szlanko, AP television producer, for the Ukraine images. Technical specifications taken from the Splav State Research and Production Association FSUE’s website. Technical drawing from here; images from here and here. Credits: Oleg V. Bebnev, A.V. Karpenko. Everywhere stamp made ​​in Ukraine) again lie in Russian petrodollars from bots? Why do you claim Ukraine with no evidence? Separatists has no MLRS Uragan & Smerch. Its too far to shoot from Russia. Someone published video(from pro-gov side) with MLRS Uragan that was shooting on some targets in Donbass.